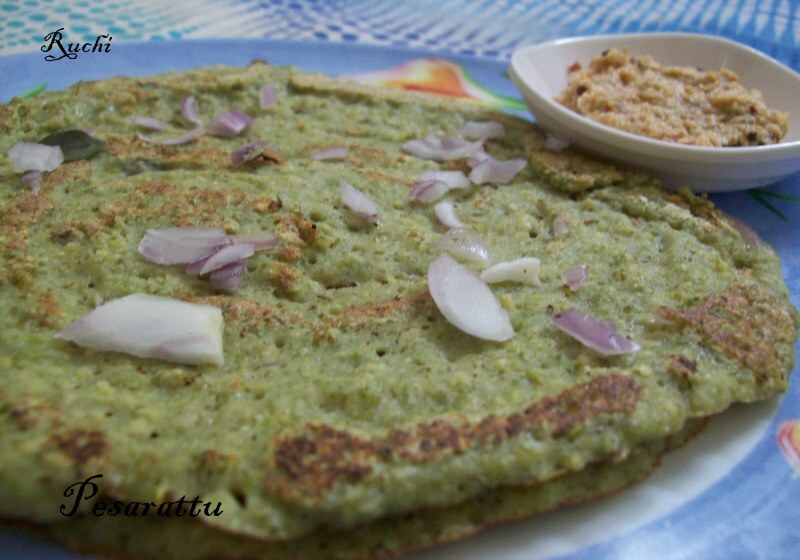 Pesarattu, traditional Andhra Pradesh dish is prepared mainly with green gram. Sometimes little rice is added for crispness. 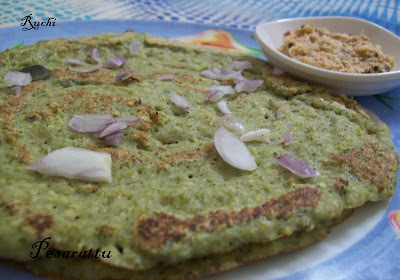 Green gram is soaked, ground with spices and without fermenting it is prepared like dosa.For this dosa you do not ferment the batter. If you are not making dosas immediately refrigerate the batter. . Pesarattu can be served with any chutney but sweet-sour ginger chutney suits well. 1. Wash the moong dal 2 or 3 times, and soak it in water for 2 hours. 2. After 2 hours, drain the moong dal and grind it with onion , ginger and green chillies, salt &rice to a smooth batter. 3Once they are finely crushed add enough water and grind again So finally it should look like dosa batter consistency. 4. While grinding water is not enough add water after transfering into a bowl. 5.Now heat a Dosa pan add 1 tspn oil and rub .when it is heated add 1 laddle full of batter and immediately rotate the batter with the same laddle to form a dosa. 6.When Corners turn light brownish reverse the pesarattu other side. Yummy pesarattu is ready to serve with hot and freshly grinded Ginger chutney. 1. Heat the oil and fry red chillies, urad dal and ginger for a minute on a medium flame. 2. 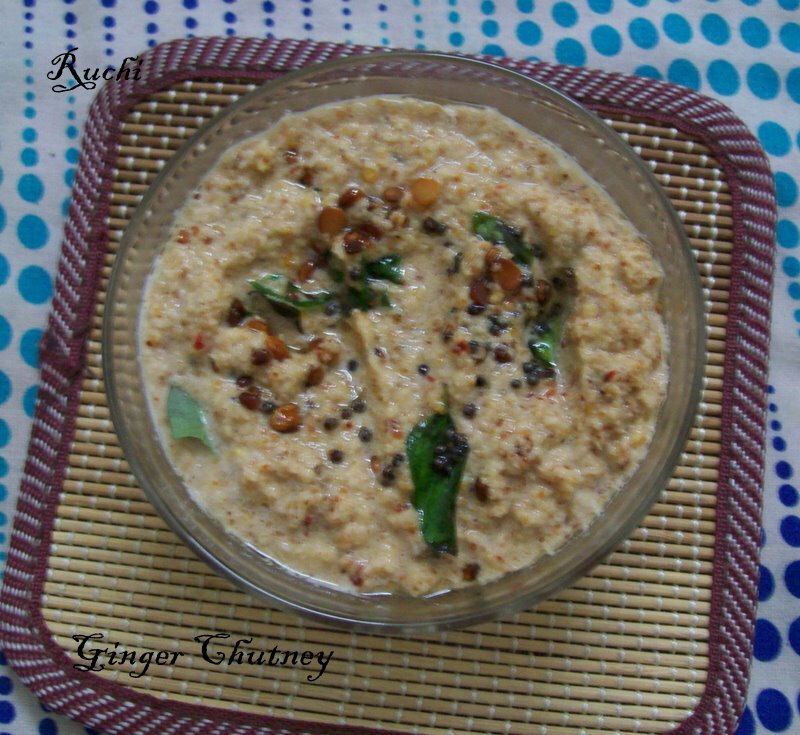 Grind the red chilli mixture along with coconut,jaggery, tamarind and salt. Keep aside. 3. Heat a the oil add the mustard seeds. 4. When they splutter,pour the tempering over the grounded chutney, mix well and keep aside. 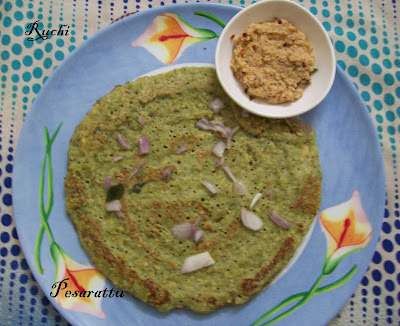 Serve with pesarattu. 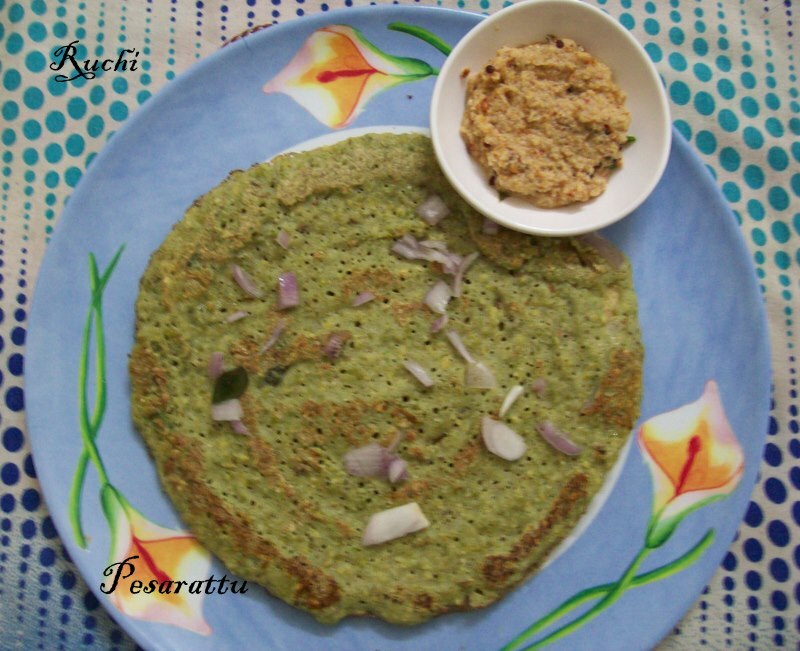 My favorite healthy break fast,sometimes i make it like adai and sometimes very thin,both ways tastes good! This is my fav breakfast dish!!! Perfect with gonger chutney! !